OH! 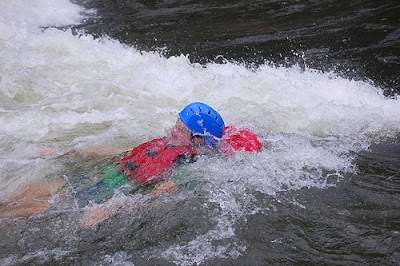 I love Whitewater Rafting. I'm so jealous! I first rafted right after my divorce and I remember thinking how the thrill and fear of it mirrored my feelings about leaving an unhappy marriage and starting a new life. Contrary to the photographic evidence below, I did survive the experience. The trip was a blast. Not only did I go on a seven mile trip through some 66-degree class III rapids, I also got to bond with coworkers, drink lots of beer, see some live reggae, and walk an old rail trail. If they do this again next year, I'm going.